Drought, Deluge, or Just Right? First of all, I would like to say hello to all that frequent Weather5280. I am honored to be sharing some of my forecasting thoughts and information with you, and hope it helps shed some light on what makes our seasonal weather tick. What does our spring and summer look like? That is a question that a lot of people want answered. Sadly, the answer is not easy for Colorado, especially those that live east of the mountains. While the northern part of the state has benefitted from some decent moisture, the southeast part of Colorado is still struggling mightily with drought. The Southeast Plains did not see as much late season rain and haven't seen as much snow as the northern part of the state. Thus, the soil remains very dry, and it is that dry soil that reinforces an already big problem. When soil is dry, it heats up more readily than moist soil. Each day the soil stays dry, means another day that the soil heats up quicker and hotter than the day before. When the soil heats up quickly during the morning, it allows the atmosphere to mix more quickly than it normally would. This allows the wind to blow quicker than it normally would, which in turn dries out the soil even more. This nasty positive feedback mechanism also causes the "dryline" (a boundary between hot dry air to the west and warm moist air to the east) to move eastward into Kansas more quickly than it normally would. This means thunderstorms have a much harder time forming due to their fuel (moisture) getting shoved to the east. Thus, drought feeds on drought, and is a very tough pattern to break until the soil becomes recharged with moisture. In terms of the forecast, I firmly believe the transition from neutral/weak La Niña to weak El Niño will occur. It is that transition time that is very important to that spring and summer forecast. Ideally, we would like it to happen during the early spring, as it would likely invigorate the southern branch of the jet stream and pave the way for moisture producing storms to become more frequent. So, lets see what various computer models have to say about this transition. The solid line near the zero line is indicative of neutral conditions. 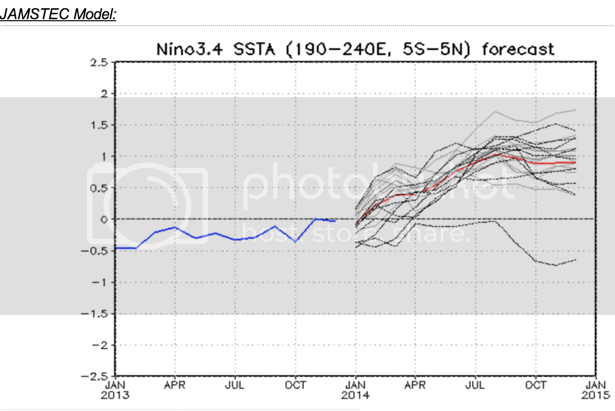 Above the zero line near .5 and above equals El Niño. Below the zero line at -.5 and below equals La Niña. 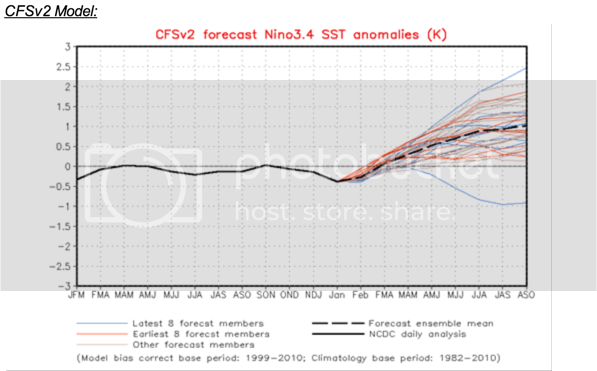 The CFSv2 shows that transition starting in March/April and crossing over into weak El Niño territory during the summer. I've been following this trend for months now, and it hasn't wavered. The POAMA is run out of Australia and is normally a very good model. 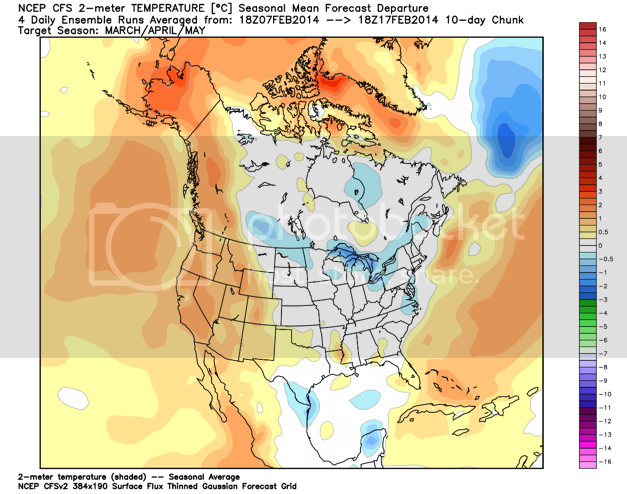 It shows the transition starting this spring and taking longer to move toward weak El Niño territory. In fact, it never quite gets classified as an El Niño. The JAMSTEC is out of Japan, and roughly shows the same transition as the CFSv2, but is slightly more aggressive with the strength of the El Niño by late summer and fall. The ECMWF is out of Europe, and is usually one of the better models out there. 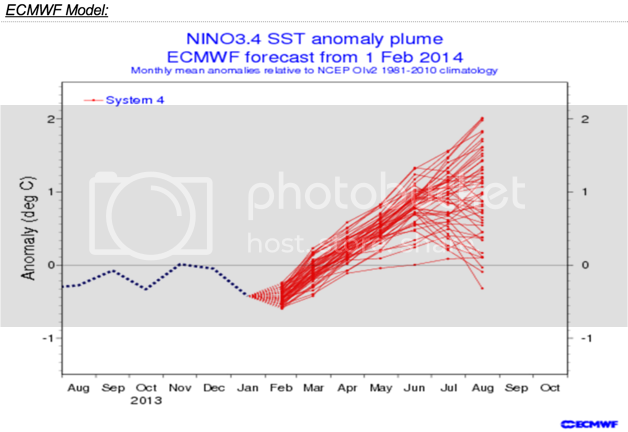 It mirrors the CFSv2 and the JAMSTEC having the crux of the ENSO transition during the spring. It also has us at weak El Niño classification during the summer. Something to note...when you see all of the various lines close together, that is indicating model confidence in the solution. When they are spread out, there is less model confidence in the solution. Thus, the models that I have shown you have a pretty high confidence in their solutions. 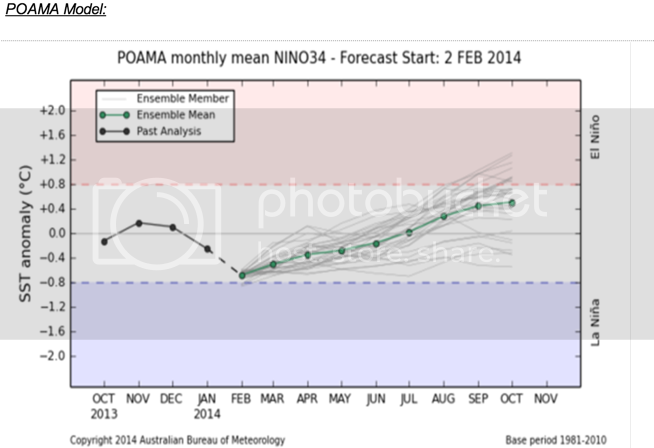 So while the strength and timing may still be in question, I feel pretty confident that a weak El Niño is on the way. Notice that the eastern two thirds of the US is near normal, with some colder than normal areas from the Northern Plains into the Great Lakes. The western part of the country shows up as warmer than normal. Specifically, western Colorado has a nice warmer than normal signal, while the east has a weaker signal. I believe we will still see some cold air make an impression on us on the eastern side of the state during March. Beyond March, not so much. 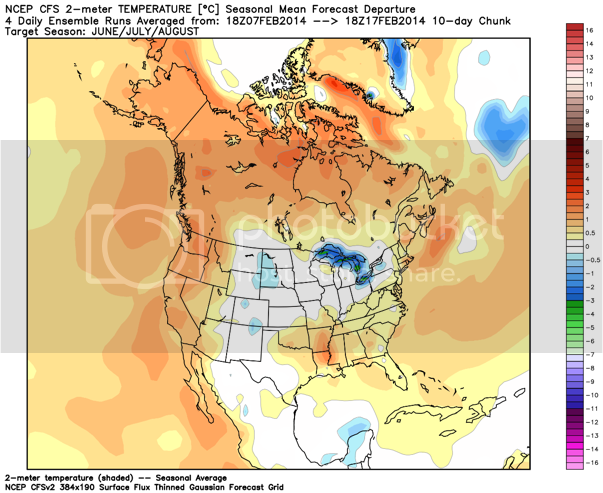 . .
For June, July, and August, the far west shows up warmer than normal, as does the Gulf Coast Region and Southeast. This is typical warmth associated with and El Niño episode. For the Rockies, Western High Plains, and Midwest, normal to slightly cooler than normal temperatures show up. 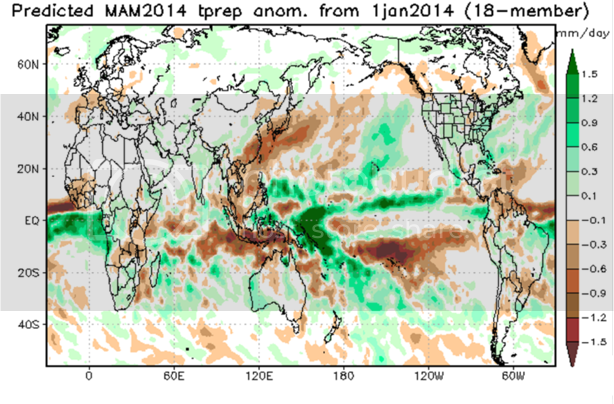 I believe this is due to an active monsoon season being forecast by the model. More clouds and rain means less sun for daytime heating, and thus normal to cooler than normal temperatures. So what about that monsoon season. . . It has been a while since all of Eastern Colorado has seen a wet spring. Tough to say if this will be the year or not, but I do think the odds are better this year than years past. 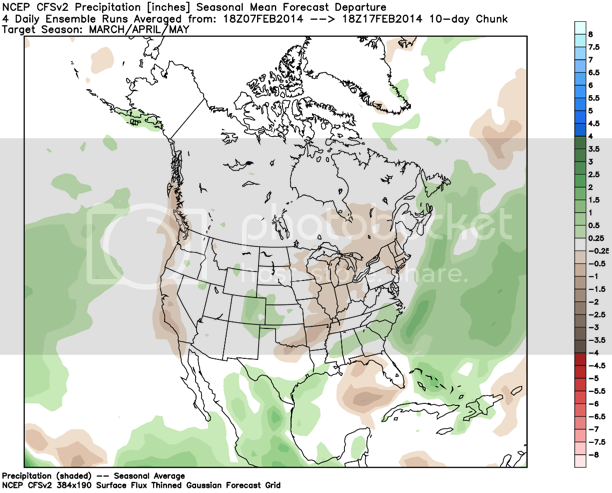 The CFSv2 also seems to think our odds of a wet spring are pretty good. That green shading in Eastern Colorado means above normal moisture. The CFSv2 has been consistent with this outlook for months, and I believe it is due to it recognizing the ENSO transition coinciding with the seasonal change. 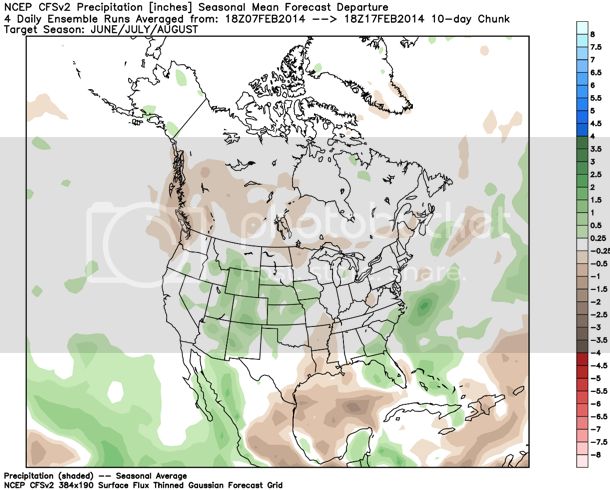 The CFSv2 also shows us having a nice monsoon season, along with most of the Rockies, Plains, and Desert Southwest. That plume of above normal moisture coincides nicely with the normal to slightly below normal temperature map. 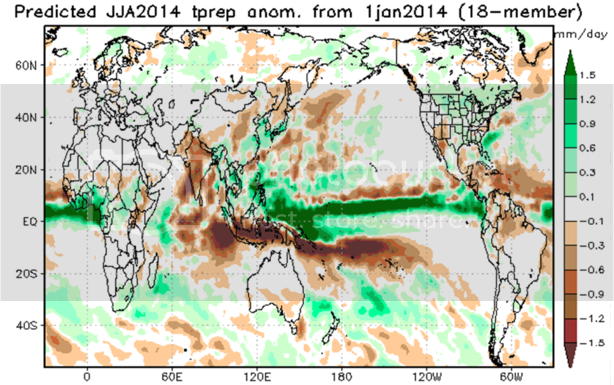 The JAMSTEC, while a bit harder to see, also has "green shading" in similar areas as the CFSv2 for March, April, and May. It has a drier monsoon season for southwest Colorado and The Desert Southwest, but adequate moisture to above normal moisture for parts of Eastern Colorado into the Northern Plains and Midwest. So it seems the discrepancy lies with the monsoon season. At this point, I am leaning a bit harder on the CFSv2 in terms of model performance. That's just it though, these are simply computer models. I will be showing you other ways to forecast such things in the future, but wanted to give you a look at what the models are showing. Crazy to think we could have a few months of above normal moisture, considering the drought we have been enduring for the past few years. However, even the drought of the mid 1950s broke and when it broke, it really broke. What was responsible for it breaking? You guessed it...a transition to El Niño.